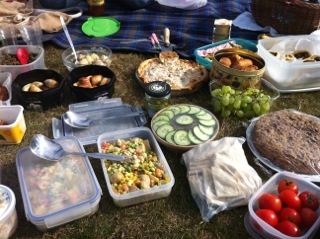 Some of the delights from this year’s vegan picnic on the East Hill. The Hastings Vegan Dining Club Fourth Annual Picnic on the East Hill recently took place in fine weather. About a dozen of us met, including Shelly, the new canine member. 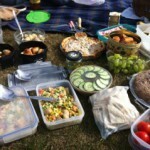 The pot-luck picnic included various salads, vol au vents, sandwiches, savoury tarts, sausage rolls and raw vegetables. Desserts included fruit cake, upside down plum cake, muffins, fresh fruit and much more! Afterwards, many of us went into Hastings to celebrate the opening of the vegan 1066 Cake Stand! This entry was posted in Eating, Living, The Grumpy Vegan Life and tagged Glimpses into the Private Life of the Grumpy Vegan. Bookmark the permalink.